I’ve been asked about what things you can do for macular degeneration and how to improve eyesight in general. Firstly I absolutely believe eyesight can be improved through lifestyle. I’m talking from my own personal experience plus the many clients I’ve worked with who saw their eyesight improve. If your eyesight is degenerating I’d say the first thing to look at is diet. In order to improve eyesight it really comes down to inundating yourself with the proper foods to prevent macular degeneration and increase blood flow to your eyes. Orange coloured fruits and vegetables contain a compound called carotene which has been shown to successfully improve eyesight. Think of foods such as papaya, oranges and carrots. Carrots have scientifically been proven to increase blood flow through your eyes. One medium size carrot eaten every single day for one week will improve blood flow through your eyes by around 30%. Studies of carotene actually show that it prevents macular degeneration. There are other foods like broccoli and kale that can also be very beneficial but it’s specifically carotene containing foods that really help with macular degeneration. Focus on foods that make the body alkaline too. To check if you’re acid or alkaline try buying some pH test strips to pee on. You want to be a pH between 7.2 and 8. When the body is acidic it cannot take up oxygen so well, which will effect the health of all your organs including your eyes. A diet high in fresh foods is the best way to alkalise the body. If you’re acidic and you need a supplement try a teaspoon of bicarbonate soda in water everyday then keep testing yourself daily to make sure you come back into the ideal pH range. Your eyes just like every other part of the body have the ability to regenerate. The best way to promote regeneration is to do an extended juice or water fast. This is because fasting gives the body the ability to heal and repair damaged or weaken tissue.There are a lot of people out there who have done an extended fast with me and then continued periodic fasting at home. Every time they fast their eyesight improves. Many clients have actually gone from fairly shocking eyesight back to 20/20 vision. Part of this process involved removing their glasses or contact lenses for a period. Glasses are a crutch so you want to get rid of them for a while if you can. Imagine you break your leg, you might have a crutch for a little while but then you take it away, otherwise your muscles will atrophy. The same thing happens with your eyes. When you’re constantly wearing glasses this is actually making things worse. It’s okay to be a little bit blurry around the house for a while. Wear them if you have to, like for driving of course, but whenever you can go without them. 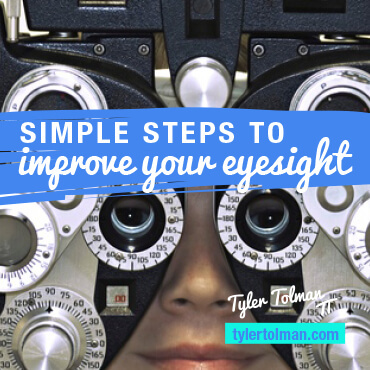 Eye exercises are important to really get your vision sharp. I’ve done another video on great eye exercises that improve your vision… I use these exercises pretty regularly but more so if I feel like I’m having issues with my eyesight. For example, when I was about 28 years old (about 6 years ago) I was helping my dad with writing a book and I was looking at a computer screen 12 hours a day for literally 6 months. I remember when we were done I was literally looking at signs and thinking, wow my eyes are getting blurry. I simply knew by improving my nutrition, doing eye exercises, and getting my eyes away from the computer would all really help. There are apps you can download to your computer that change the colour of your screen or you can use a screen cover that is not so harsh on the eyes. When it comes to technology I recommend just having some balance. Don’t always be looking at your cellphone, iPad, computer or whatever it is. Instead go outside go for a walk and look around. When you walk barefoot on a beach or anywhere out in nature your eyes are constantly on the move, looking up and looking down, making sure you don’t trip on anything. There’s constant adjusting that takes place which improves your eyes. Another benefit of being in nature is that even the colour green is healing for the eyes. Sight is the most beautiful gifts that we have and I know with my lifestyle my eyesight will be fresh and clear and 20/20 until I’m around 6,180 years old, and then it might start to deteriorate 😉 So thanks for watching this video I hope you got a lot out of it and if you did go and hit the share button. Have a good day! Can eye cataracts be prevented or reversed?